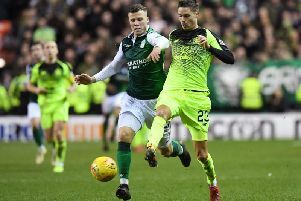 Revitalised Jason Cummings believes his vibrant support cast at Hibs can help him eclipse last season’s scoring tally this term. The Easter Road side’s top scorer took his tally for the campaign to 12 when he scored a double in Friday night’s 3-0 win over Championship title rivals Dundee United. The 21-year-old striker has now scored four times in his past four appearances after going a full three months without a goal between mid-September and mid-December, when he became a peripheral figure. After rediscovering his mojo, Cummings is confident that quality service from the likes of recent recruits Kris Commons and Chris Humphrey, as well as fit-again midfielder John McGinn, can help him finish the season with a flourish as he aims to beat last term’s tally of 25 goals. Cummings was supported in attack by Commons on Friday, six days after the pair had linked up for the 21-year-old’s goal in the victory at Falkirk. Cummings would love to see the 33-year-old Celtic player extend his short-term loan at Easter Road until the end of the season. Cummings was thrilled to see his close friend McGinn return to action with a goal following seven weeks on the sidelines recovering from ankle surgery. The Scotland midfielder – nicknamed Meatball – was given a rousing reception when he stepped off the bench in the 78th minute and he duly sealed an emphatic victory with a brilliant solo effort just three minutes later. “The Meatball came on and it turned into the John McGinn show,” said Cummings. “I don’t know how he sneaked that goal past the keeper. I was honestly delighted for him as he has had a hard time of it with injury over the last few weeks. It was a fitting reward for him because he’s worked so hard. Cummings hopes he has now re-established himself as a first pick under Neil Lennon after going almost two months without starting a match prior to last month’s home win over Dumbarton. “When you are not playing a lot of thoughts go round your head,” he said. “You think ‘I need to come on here and make an impact or I am going to be benched again’ – it’s as simple as that. If you look at the strikers that are on the bench, we all feel that we should be playing, but the manager can only pick 11 players. Lennon described Hibs’ performance again United as their best since he took charge last summer. Coming so soon after a dramatic late victory away to Falkirk, it was enough to take them four points clear of the Tayside team at the top of the league. After a sticky patch before Christmas, Cummings admits belief levels are soaring again, but, with 16 games still to play, he insists no-one is taking it for granted that the title is already in the bag. “We were really good and it clicked for us against Dundee United,” he said. “Everybody was on their ‘A’ game. The keeper had a brilliant save, the back four were solid and big Marvin [Bartley] was man of the match. The boys are flying high at the minute.